Amazon has this handy DC wattmeter for sale. 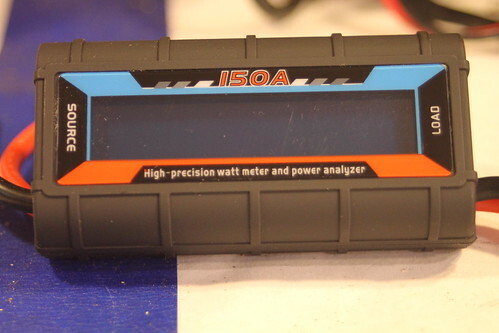 Similar to a Kill-A-Watt, but for DC, a three-terminal meter like this is invaluable for measuring power at varying voltages, which is a common occurrence with solar grids. This sort of meter is normally useful for measuring efficiences of DC-DC converters; however, due to the design using the circuit under load for lighting, some accuracy is lost due to the power consumption of the meter itself. 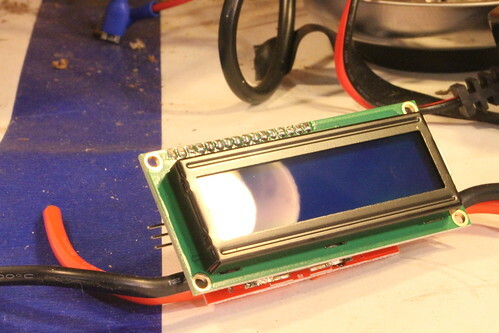 The LCD is a 1602 display, a common part with 2 lines of 16 characters each. 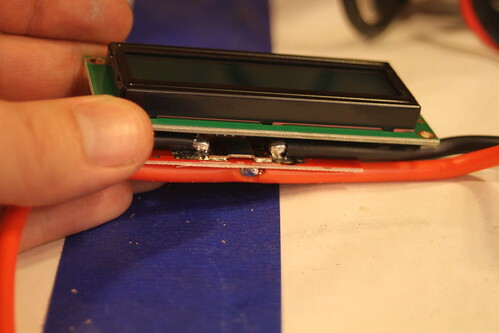 Interestingly, in one of my photos, it is barely possible to see the microscopic wires run inside the display itself. They are easier to spot with a human eye, but can be seen between the overexposed reflection of the lamp bulb and the reflection of the lamp shade. The test ciruit is a power resistor on the ground path, while the positive lines are connected together. By soldering the wire sideways the manufacturer cuts down on the number of large solder joints although this one may be harder to make than two fully stripped joints. Also in this way additional, less controlled, resistance to the load is minimized. 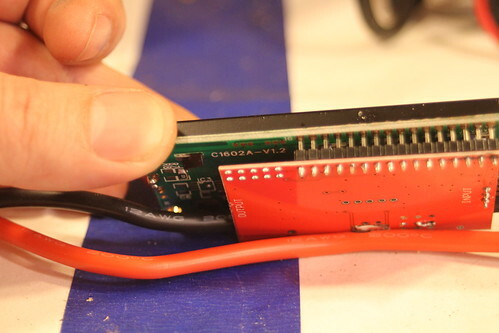 The voltage difference from the ground resistor is measured and fed to what appears to be a microcontroller that then renders the display. Since the two boards are soldered together I could not get a good shot of the chip.